New RED complete steering wheel kit for your classic. This wheel was originally a factory option for all 1969 Nova and Chevelle models. Commonly referred to as the cushion grip or comfort grip wheel. It can be added to any year model you prefer. Great looks with a classic feel. In this set you get everything needed to install and also the contact to make your horn work. This version has a correct 14" inside diameter wheel with a depth measurement of 2 and 7/8 inches. The 14 inch diameter is from the center of the outer grip to the other side center. Awesome wheel that looks great in any GM model. For cars with or without a tilt steering column. Please select your options of either 67-68 model or 69 - 72 model from the available drop-down menu. We give you more to get the job done right the first time! 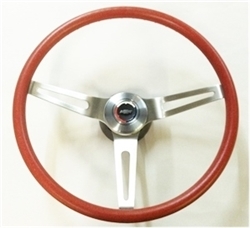 Kit includes a USA made horn cap, mounting hub, horn contact set, spring, plunger, and RED comfort grip wheel.